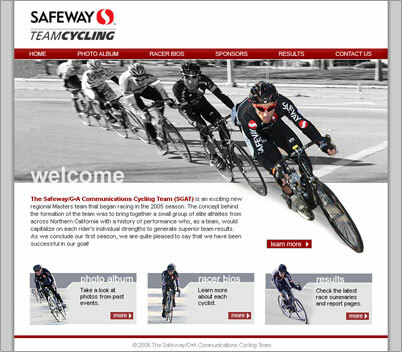 safeway team cycling wanted a exciting new web site to go along with their new racing team. using the cycling teams colors, a dynamic site was created. with the team's philosopy to 'genererate superior team results' in mind, the main header was created in a fashion where the safeway cyclist is in the lead and the only one in color. users should have no difficulty finding their way with simple top navigations along with bottom graphic links that go directly to the most popular sections from the home page.